Among the many great exhibits at the World War II Vehicle Museum and Learning Center is this cut-down M4 Sherman hull. What is great about this is that the removal of the upper hull and turret allows one an extraordinary view of the driver and radio operator's stations. The overall view at left shows the driver's (left) and assistant driver's (right) stations, with the transmission on the floor in the center. 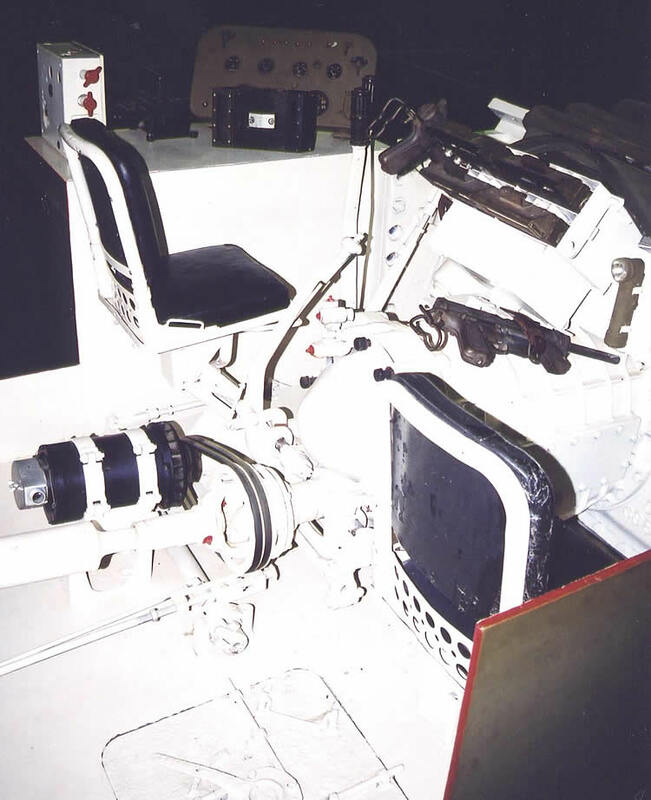 This photo gives us a good view of the rear of the seats, including the elevating mechanism that allowed the crew to stick their heads and shoulders out of the hatches. 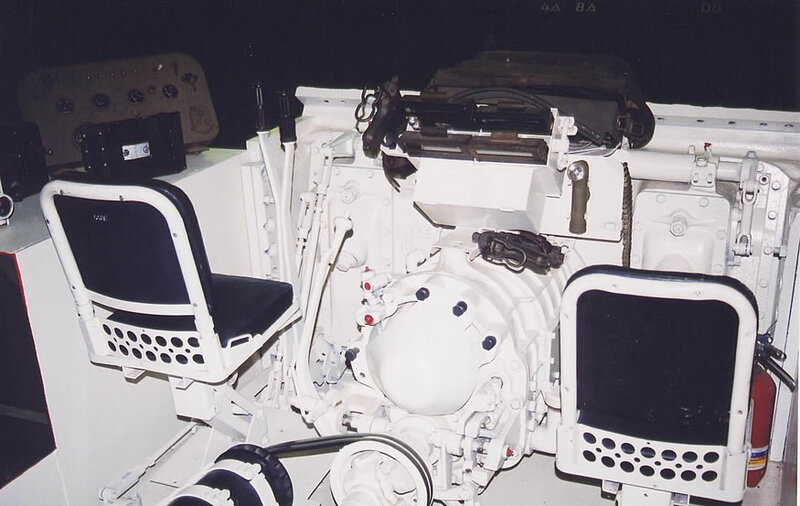 The seat assemblies are identical to a number of other U.S. armoured vehicles, including the M18 Hellcat. A fire extinguisher can be seen at the front of the assistant driver's station. A useful view of the assistant driver's postion is dominated by the right side of the transmission. The assistant driver's personal weapon, an M3A1 "Grease Gun," is clipped on top of the transmission, with a flashlight in front of that. Note that the assistant driver does not have any driving controls. 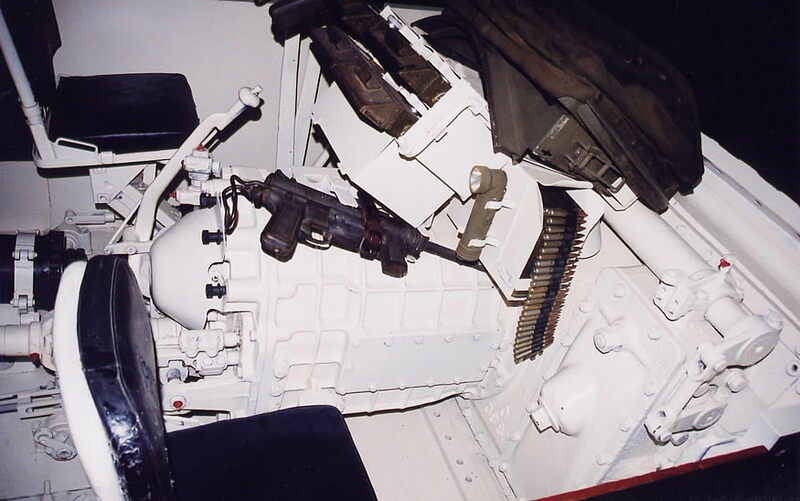 Also of note is the driver's bad weather hood stowed over top of the transmission, with the ammunition box for the .30 caliber bow machine gun below that. This is the back of the transmission, looking forwards towards the driver's position. 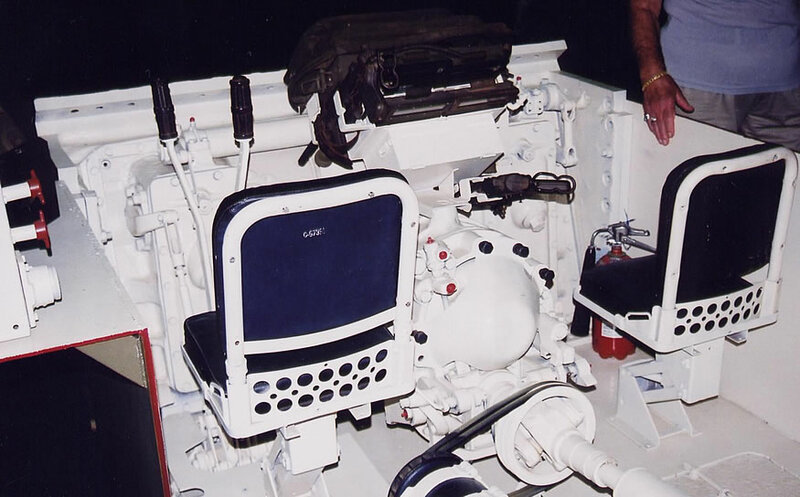 The assistant driver's M3A1 can be seen again, with a stowage box and rack for spare periscopes above that. The lever to the left is the transmission gearshift lever. This photograph looks backwards towards the driver's seat; the transmission housing is visible at the bottom of the picture. 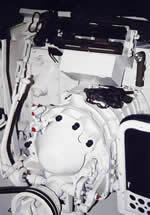 The driver's steering brake control levers are prominent in front of his seat, and his M3A1 can be seen stowed on the side of the transmission, just to the left of the driver's bad weather hood; the head of the driver's flashlight can just be seen poking out from beneath the driver's hood, to the left of the submachine gun's muzzle. The drive shaft, which ran underneath the turret, can be seen going back to the main bulkhead. Our final shot looks at the driver's compartment from the right rear. 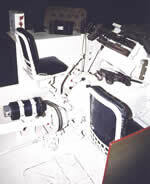 In the foreground, the escape hatch can be seen in the floor, behind the assistant driver's seat. 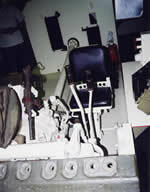 The instrument panel sits on the sponson to the driver's left (from the shape of it, this is a late-model Sherman), with the two red handles for activating the fire extinguishers just beside the driver's left shoulder. The belts coming off of the driveshaft, just before it enters the transmission, power the alternator, which would usually be hooked up the a series of batteries that would be under the turret floor. these vehicles are essentially similar.